Former X Factor contestants JLS have ousted show judge Cheryl Cole from the top of the singles chart. The boy band topped the chart with Everybody in Love, their second single, knocking Cole's Fight For This Love off the top spot it had held for two weeks. However, the Girls Aloud singer stayed at number one in the albums chart with her debut long-player 3 Words. Veteran US rockers Bon Jovi saw their new album The Circle enter the chart at number two. New entries in the singles chart included Kesha at number six with Tik Tok, and Chase and Status's End Credits at number nine. Foo Fighters' Greatest Hits album entered at four, while classical singer Katherine Jenkins made number nine with The Ultimate Collection. JLS are the first British act to have had two number one hits in the same year since McFly in 2006, the Official Charts Company said. 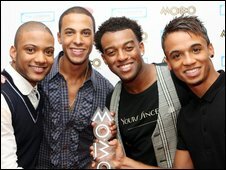 Member Oritse Williams said: "To have our first two singles go to number one is more than we ever expected." Cole's single Fight for this Love was the fastest selling debut single of the year, followed by JLS' first release Beat Again.